Barça Lassa are into the semi-finals of the Copa del Rey to be played in León. Xavi Pascual’s team beat Bada Huesca 32-19 in a match the blaugranas slowly took control of the scoreboard. 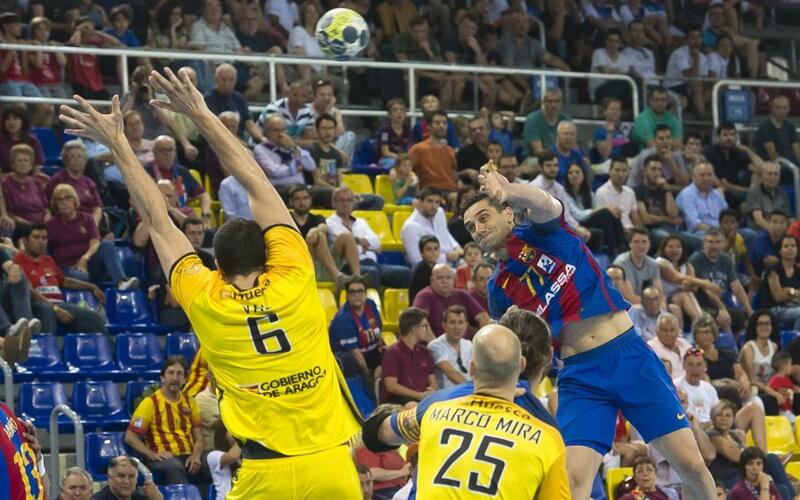 This Saturday, Barça Lassa will play Fraikin Granollers at 6.00pm CET on Saturday. The Catalans started strongly with Rául Entrerríos leading the charge in attack. They were 6-3 up after ten minutes. The team from Aragon responded well through some impressive defence and they managed to close the gap to 6-5 after 18 minutes. Two Barça goals re-established their three-goal lead with under ten minutes to go (8-5). The blaugranas rotated their team and they got some newfound intensity in both defence and attack. Tomás gave them their biggest lead so far in the 24th minute when he made it 13-6. They maintained their concentration and they went into the break with a 16-8 lead. Even though Barça were eight goals up at the break they started the second half with real intensity and by the 35th minute they were 19-11 up. Pérez de Vargas’ stops also contributed to his side’s dominance and they were able to press home the advantage (32-19). Xavi Pascual’s now go on to face Fraikin BM Granollers in the semi-finals of the Copa del Rey at 6.00pm CET on 10 June.